Excelent staff, all areas very clean and great location. Quite small room but okay. To improve: change mattres, they are very uncomfortable. Decent premises, looks and feels more like a hotel arrangement, but that is fine by me as I'm a traveller that appreciates comfort. Smarty is a very very clean place and the beds are comfy so you will enjoy a good sleep here as it is on a quiet residential street. Its only downfall really is that the layout is not conducive for socialising, there is a no alcohol policy, and the area of interest is around about 1km away from the Reine river & where most of the attractions of the city are centred. Accessible & price was fine, but there aren’t lockers in the rooms (not even small ones) and not enough outlets—no reading lamps either. The fact they charge you in advance should be listed in booking info, and they actually tried to charge me literally 100x what they should have (guess they forgot the decimal point?) and barely apologized. Fine but not impressed overall, and they need to pivot the attention they spend updating the lobby to the actual rooms, which have chipped paint everywhere. In general the place is very nice! The staff on reception were not polite and they have not given some many attention to me when I arrived and had some questions. It was a nice hostel, we would recommend it - staff were friendly, the location was not too bad and the rooms were nice. However the kitchen was hard to use as dirty and lots of dirty dishes and it was missing a lot of necessary utensils and basics. The layout of the rooms meant it was very squishy and no where to put suitcases, and it was inconvienient to have 1 bathroom for 8 people especially when our shower was broken so the pressure was bad and if it would almost flood. Great otherwise! A little far from the train station, but close to hip areas. Staff was extremely nice and accommodating during our stay. When we arrived, we learned that we would be in separate rooms, we then asked if there was a way for us to be put together. One of the receptionists immediately shuffled some things around and got us into a private 4 bed room without charging us extra (we had only booked a mixed room). The room itself was very clean, but if you are sensitive to noise, buy some earplugs! 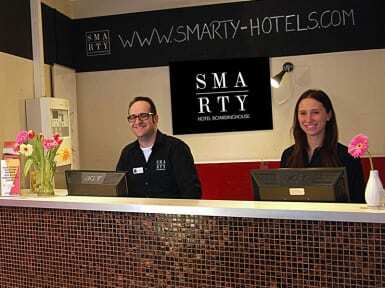 We didn’t like smarty hotel as : The rooms were far too small. Badly decorated. From 10am, Hoover, drills and other loud sounds prevented us from resting. People insisted my knocked on our door 3 times in the morning. We thought we had to check out at 12 but it was at 11. We got ready as fast as possible and said we didn’t mind paying a little extra. The manager came 15 minutes after and almost kicked us out. They were impatient and not understanding. Not happy at all ! Had to check out and stay at another hotel due the noise. Management moved me rooms, simply to another level that had the same noise of other guests running around banging on doors all night. Management have no control over rowdy guests. Overcharged 90 euro at check in. Still waiting for a refund. The staff and management do not reply to emails. Can someone from accounts department or head office please assist with this? This is a poorly managed hostel.